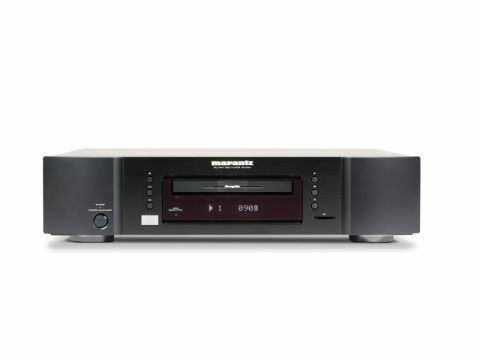 Unlike rival Blu-ray players from the likes of LG and Samsung, Marantz' second-generation deck, the BD7004, isn't packed with cutting-edge functions such as Wi-Fi networking or YouTube playback. Its brief is rather different: to deliver the sort of high-class picture, sound and build quality that home cinema connoisseurs crave, without getting all hung up on prices or salesman-friendly gimmicks. This approach is obvious from our first hands-on encounter – its big, stocky shape, curved aluminium front panel and considerable weight (bulked out by an extra metal plate fixed to the top cover) make it feel distinctly 'high-end'. Supplying the finesse are a couple of embossed silver Blu-ray logos on the fascia, and a whisper-quiet disc tray that glides forward gorgeously. The BD7004 offers a standard Profile 2.0 spec, which enables you to download or stream BD Live content from the internet over an Ethernet connection, as opposed to the much more fashionable wireless approach employed by the LG BD390 and Samsung BD-P3600. While disappointing, that isn't a deal-breaker in itself, given the amount of other decks without it. Slightly harder to swallow is the lack of built-in memory for storing downloads, which is pretty much imperative at this price. Instead you have to insert an SD card into the front-mounted slot, which means extra cost and hassle. Joining the Ethernet port on the back panel is a set of 7.1-channel analogue outputs for piping decoded HD audio to your amp. Another bonus is DivX HD playback (from BD, DVD or CD), which is still fairly rare among Blu-ray players. We played a variety of clips and the results were incredibly sharp and fluid, marking out this deck as a good choice for those intending to play downloaded or self-encoded HD video. Note, too, that the deck boasts Anchor Bay's lauded VRS processor for upscaling DVDs to 1080p. The BD7004 is not a speedy operator. It takes forever to boot up or eject a BD disc, and in the time it takes to load you might as well go and put the kettle on. At least the menu system is easy to use, while the set-up screen is sensibly structured and split into Custom and Quick menus. To make picture adjustments you have to hit the Mode button during playback. Here, the levels of contrast, brightness, sharpness, gamma correction and colour can be altered, while five memory presets will save your adjustments. The remote's convenient button placement makes it pleasant to use. Owners of Marantz receivers can control volume and input selection using the panel of keys at the base. Video performance is devilishly good. Full HD images transported to a TV in pure digital form are every bit as sharp and punchy as you'd hope. Spinning Monsters Vs Aliens, we witnessed the picture's irresistible depth and vibrancy. The intricate CGI detail is rendered with pin-point sharpness, epitomised by the well-defined texture of The Missing Link's shiny, scaly body, while strong contrast and shadow detail gives the movie's few moments of darkness a great deal of clarity. We haven't seen colours this vivid and radiant since Mr Motivator was last on GMTV, and there are no picture artefacts to mar the quality. Switch to live action fare such as Children of Men and the true quality of the BD7004's pictures really shines through. The dank, grimy London streets are rendered in all their squalid glory, with tons of detail and a rich, cinematic feel. Also impressive is the smooth and natural motion tracking, most notably during the woodland ambush scene when motorbikes, cars and running people dart about the screen. While good, though, the picture quality is no better than players costing less than half the price, which doesn't exactly help the deck justify its price tag. That said, DVDs are expertly converted to 1080p. We tried catching out the VRS chip with the Silicon Optix HQV disc, but it breezed through all of the tests, showing a similar level of processing quality as a high-end DVD deck. So movies look terrific thanks to the artefact-free motion handling and detail retrieval. Here's where the Marantz has a distinct advantage over the ranks of budget Blu-ray players on the market. CD playback using the isolated stereo outputs is sheer luxury, which means you can easily justify using this as your main music player if the rest of your system's up to scratch. It's a dab hand with movies too, particularly when using the 7.1-channel outputs. Its dynamic, expansive sound effortlessly conveys the energy of large-scale action scenes, but it also demonstrates finesse and sensitivity when communicating dialogue driven scenes. Rest assured that you get the same enthralling sound quality when the signals are transferred digitally over HDMI. If you like your Blu-ray players beautifully built and believe that sound quality is a key attraction, then the BD7004 will seem like £700 well spent. But most people will see the lack of Wi-Fi and built-in memory, as well as its slow operating speed, and plump for a player like the £250 LG BD390, which offers loads more features, equally good pictures and considerably faster operation.